As my little ones Water Babies journey nears its end with graduation looming, I am taking time to reflect and look back on what we have both achieved over the past four and a bit years since our lessons began. I say “our” lessons because they really have been “our” lessons, it has been a joint experience, we have learnt together, our fabulous teachers have taught me how to teach my little one to swim. From the gentle beginnings of us both becoming comfortable in the water to giving me the confidence and courage to let me toddler go and watch her swim completely independently across the pool…a very proud moment! Right from the very beginning we were guided and nurtured through skills and techniques by our teacher that began to lay the foundations of Eliza being not only safe in the water but beginning to swim. One of the most important aspects behind my choice to start swimming classes at such a young age was for my children to be safe around water, from our very first class, safety skills began to be introduced, gently developing word association and understanding that eventually would teach my little one how to get to safety in an emergency. I still remember that pride and excitement when she held on, on their own for the very first time…it was so amazing at just 4 months (and some in the class certainly did this younger – wow!). All of the fantastic songs, skills and games that were the building block to unbelievably confident independent swimmer she is now is. From those tiny little kicks in the early baby chapters to those huge splashing kicks as a young toddler to now elegant (at times?!) little kicks with pointy toes, every skill or game has a purpose (and your little one doesn’t even realise). I have witnessed first hand the benefits that swimming can have, when July comes, both my children will have completed the full Water Babies “programme”. They are physically strong and have great co-ordination, their speech and understanding came at a very early age and I honestly feel that their lessons played a part in this. Also I am not going to lie, I still enjoy the afternoon nap we get home after each lesson, giving me chance for a enjoy nice warm cuppa!!! All of the teachers are fantastic and will hold a special place in our hearts as they nurtured us through the different stages in our journey. Each teacher has constantly talked and communicated directly with each individual child in the lessons giving them their time and attention. They ensure everyone is involved and included within the class regardless of whether they have decided to throw the biggest toddler tantrum ever and are refusing to do anything they are asked!!! To the tiny baby who screams all the way through their first lesson, or the mum who can’t swim so is a bit anxious about being in the pool. Or perhaps mum or dad are having a hard time and not feeling up to giving the class their all that day, the teachers work their magic making it an enjoyable half hour. The teachers have always shown understanding, patience and empathy to both child and parent. They clearly love what they do and put their all into each and every lesson, and as parents themselves, they understand! Water Babies, our journey, has been magical and we don’t want it to end, but on the day we depart our final class we will no doubt shed a few tears, but we will be leaving with a truly confident Water Baby who will go on to enjoy thoroughly the next phase in their swimming journey thanks to everything you have done for us! This short film shows a little one at the start of their Water Babies journey and then a pre-schooler nearing the end of her Water Babies journey, to give an insight into the skills that are developed, where they start and how they progress. 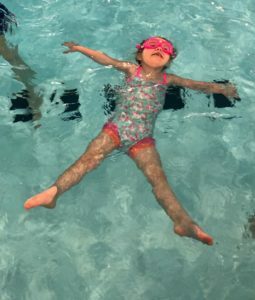 When little ones join Water Babies classes they are placed in classes that are suitable to their age and stage of development, you would certainly never have a class where there was a 6month baby and a 3.5year old toddler like there is here! The skills and activities delivered at in each Chapter are tailored to the baby or toddlers stage of development; song, games and interaction with toys are utilised to ensure the classes are enjoyable whilst laying the foundations of swimming and key water safety skills. Water Babies swim at locations in and in close proximity to Ryedale. For any Mumblers that book onto a course, just quote RYEDALE MUMBLER and we will send them a free Splashabout Happy Nappy (required for the lessons) with their starter pack – worth £9.99.